Hi ladies! Things have been CRAZY lately so unfortunately the blog has had to go on the backburner a bit. I'm so time poor! =( I only have a quick swatch for you today of gorgeous Beauty Line Cosmetics 345 Christina sent to me a while ago. 345 is a beautiful dark turquoise creme. Application was flawless and it is wonderfully opaque - you can get away with 1 coat if you're careful but I did 2 out of habit. Man oh man I adore this polish!! 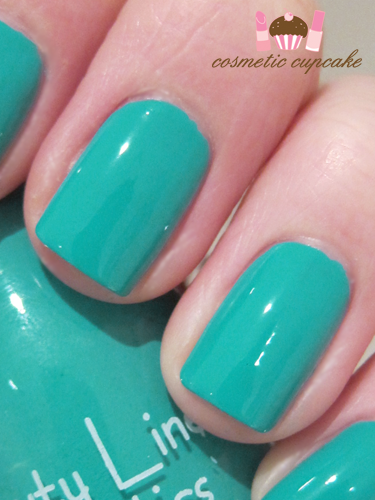 I looooooooove these gorgeous cyan shades. Unfortunately it was a pain in the you know what to capture as my camera kept wanting to make it blue so I had to tweak the colours a bit. So pretty, that's my favorite color! and your nails are so perfectly manicured? Are they your real nails? I couldn't agree with you more Jac! I'm always sucked in by these shades! Already reaved on Instagram but such a gorgeous turquoise!!! The BeautyLine polishes are very very nice :) such a treat! Amazing color! Love your nails!